Monster Truck Madness – King of the Monster Trucks « Big Squid RC – RC Car and Truck News, Reviews, Videos, and More! Greetings gang, happy Tuesday. Today I come to you with an announcement! The JConcepts King of the Monster Trucks event is going to take place October 6-7, 2018 at Vinyl Images in Fenton, MO, and we’d love to see you there! If you’ve never taken part in a solid axle monster truck event before, imagine a full sized event that’s scaled down to 1/10. It’s a lot of fun, even for newbies! 6 Monster Truck Classes will be offered. Classic Retro, Outlaw Retro Clodbuster, Sport Modified, Pro-Modified, Mega Truck and Tuff Truck. You can find a full set of rules right here. Saturday will feature a show-n-shine followed by timed qualifying and heads-up elimination racing for each of the 6 classes. Sunday will feature the judged Big Squid RC Freestyle competition for Sport Modified and Pro-Modifed Monster Truck classes, where vehicles get a minute and thirty seconds to go as big as they can! 3 trucks will be allowed per entrant, per class. The first 50 paid entrants will receive a JConcepts Monster Truck body that’s debuting at the event. There will be raffle giveaways throughout the event for all paid entrants. BIGFOOT® #1, The Original Monster Truck®, will be on display the whole weekend! Racing and Freestyle Events will be filmed for YouTube, as well as various driver interviews and vehicle spotlights. Full coverage of the event will also be featured right here on Big Squid. Paid entrants will receive a professional photo of each of their competition vehicles. Guest appearances by monster truck legends. Event held at Vinyl Images in Fenton, MO. The fees are $20 dollars for the first entry, $10 for the second and $5 for each additional up to a $50 max. Remember folks, FUN is the name of the game when it comes to scale monster truck racing. Even if you aren’t going to race, we’d love to have you come out and see the show! Heck, we may even be able to get Cubby to come out and try his hand at it! 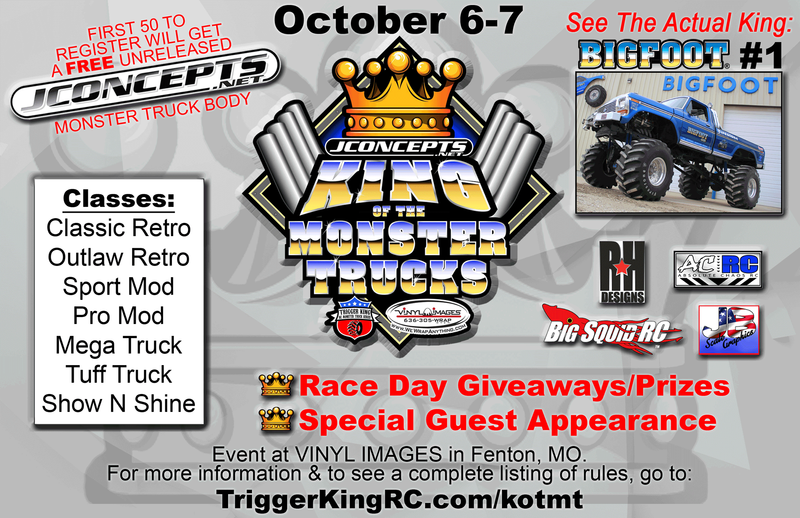 For full event details and registration info, you can visit the JConcepts King of the Monster Trucks web page right here. If you have any additional questions, please don’t hesitate to contact me directly at doug at bigsquidrc.com.